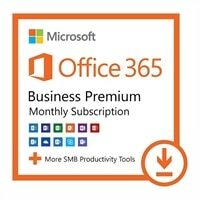 Office 365 Business Premium from Dell - Monthly SubscriptionWork from anywhere on all your devices with all your familiar Microsoft Office applications, backed by Dell’s Cloud Concierge Service. Onboarding, set-up and migration services INCLUDED at no additional cost. 24x7 support from a real person via email, chat, phone, or on-site for additional cost. Office 365 CSP dedicated and Microsoft Cloud Certified support team, exclusively for Dell customers. End user support for Microsoft Office exclusively from Dell. Store, sync, and share your files online so they're always up to date. Plus, you can edit documents with others in real time. Get discovered and nurture customer relationships with Outlook Customer Manager. Manage your business better with Microsoft Bookings. Communicate using messaging, voice calls, and video calls, and let people know your availability with your online status. Share presence, messaging, and audio calling with Skype users. Connect your teams with Microsoft Teams in Office 365, where chat, content, people, and tools live together, so your teams have instant access to everything they need. Inform and engage your organization and connect people to content, expertise, and processes with team sites. Tell your story with beautiful communication sites. Unlock creativity in your organization with search across Office 365 based on personalized insights. Discover content and expertise with the power of the Microsoft Graph, using your connection and collaboration patterns. Access intelligent search across a range of experiences, including SharePoint, Delve and Office applications. Microsoft Kaizala makes it easy to connect and coordinate with your Firstline workers, partners, and customers – wherever they are – using a simple-to-use chat interface.